Watch Seinfeld Season 2 Episode 10 online via TV Fanatic with over 5 options to watch the Seinfeld S2E10 full episode. Affiliates with free and paid streaming include Amazon, Vudu, YouTube Purchase, Google Play, and Hulu Plus. 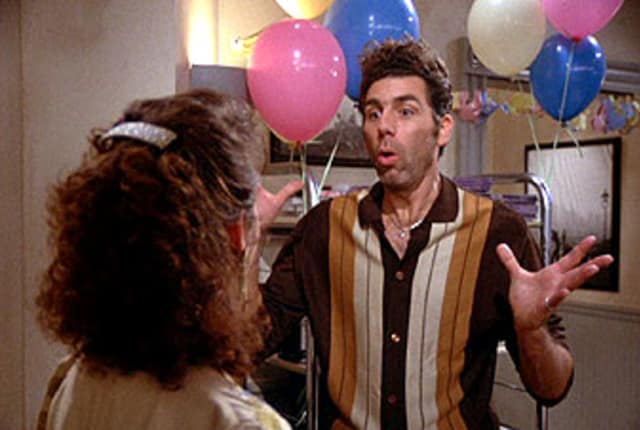 Elaine hosts a baby shower at Jerry's apartment. There, George attempts to tell off a girl for the worst date of his life and Kramer convinces Jerry to pirate cable. George: Someday, before I die, mark my words I'm gonna tell that woman exactly what I think of her. I'll never be able to forgive myself until I do. George: I still won't be able to forgive myself, but at least it won't be about this. Man, it's the ninetiesit's Hammer time! Permalink: Man, it's the ninetiesit's Hammer time!